The ergonomic evaluation findings provide detailed biomechanical information, photographs depicting ergonomic risks, and suggested actions that could be implemented to reduce risk exposures. Recommendations are proposed to improve the person's working postures, and to determine the best course of action needed to improve the workplace and reduce discomfort. The ergonomic overview identifies primary work flow issues and any shortcomings of existing workstation equipment. Call us for an on-site office ergonomic assessment quote. This custom analysis coordinates the worker with their computer components, job requirements and home furnishings. 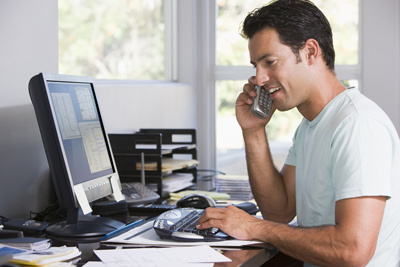 Some people work at home several days a week while for others - a home office is their only office, 9 to 5. It doesn’t matter if you use a home office for just a few hours a week or eight hours a day. A home office is a designated workplace and should be designed for comfort and efficiency in mind. Call us for a home office ergonomic assessment quote. Our unique online ergonomic eValuations provide ergonomic support for off-site employees. Many organizations are using computer and telecommunication technologies to extend its capabilities by working with employees or contractors located throughout the country or the world. Using e-mail, faxes, instant messaging, data and videoconferencing allows companies to broaden their communication resources to with separate office environments and remote employees. Purchasing, installation and adjustment training of product solutions can be done through cessi.